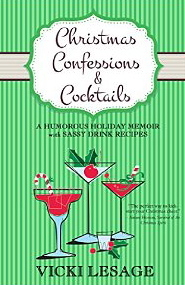 My review today is for Christmas Confessions and Cocktails: A Humorous Holiday Memoir with Sassy Drink Recipes by Vicki Lesage, the latest in her Paris Confessions series of memoirs. This book is written in the same fun lively style of writing that I have come to expect from Vicki’s memoirs about her life in France, but this one was a little different. I found a more mellow side to Vicki here; the wild party girl was somewhat replaced by someone to whom family life is obviously very important, as important in fact, as having a good time. This book includes twenty-five fun snippets of her life, loosely centered on the Christmas theme; both before and after she moved to France and many of these snippets are from times in her life when her family is together and celebrating. As usual she includes the bad as well as the good, but all are told in a way that made me smile. At the end of each one is an invitation to join her in a celebratory cocktail (or two), well, OK it is just the recipes, but it felt like she was inviting me to join in her fun. Cheers Vicki, thanks for another fun read and have a great Christmas! All of the books in Vicki’s Paris Confessions series are available in ebook and paperback format and links to Amazon can be found below. A free taster of her memoirs can be found in her ebook memoirette Petite Confessions: A Humorous Memoirette with Sassy Drink Recipes .